Here it is, the final Thoughts On A Sunday for 2017. Where did the year go? One thing we have been battling with since Christmas has been the sub-zero temperatures. Not that we haven't had below zero temps around Christmas before, but in this case it's been for days on end. To give you an idea, freezing rain fell at the end of the Christmas Day snowstorm and coated the trees with ice. None of that ice has melted and many of the trees coated with that ice are still bent over or have limbs that are sagging to the ground under the weight of that ice. Another downside has been frozen pipes. One of the bathrooms here at The Manse has had a shower and a bathtub made unusable because the pipes feeding them have frozen and have not yet thawed. The earliest that might happen is later this coming week when the high temps will be in the 20's. Another downside to the sub-zero temps has been the difficulty working outside. The wind chills make it extremely uncomfortable if not impossible (and dangerous) to work outside for more than a few minutes. There is still snow from the Christmas Day storm that I need to remove, but the cold has made it difficult to do so. Lengthy diatribes against SWAT teams were posted even though not a single report that I could find mentioned anything about a SWAT team. (That doesn't mean it wasn't SWAT who was involved. I just haven't seen any reports that they were.) It just as likely that it was a patrol officer responding to the scene of the alleged hostage situation who fired the fatal shot. But as so many on one side of the political aisle have said, why let the facts get in the way of promoting the narrative? Patterico has his views on the Wichita SWATting, he himself having been on the receiving end of a swatting back in 2011. I read this and realized the people making the claim still don't know the difference between climate and weather. What's “this”? Heavy Erie Snow Is 'Totally' Climate Change. 'They' claim that because Lake Erie was warmer than normal (not that they've proved that), the lake effect snow that blanketed Erie, Pennsylvania was caused purely by climate change. However, I'd like to point out that it isn't often that sub-zero temperatures and winds out of the north hit Erie at this time of year, particularly at the same time. It's likely that this was a once-every-so-often event. But if it happens again next year, and the year after that, and the year after that for a decade or so, then climate change might be a cause. First, Lake Erie is rarely frozen over in its entirety. The last time that Lake Erie froze over in its entirely was February 2010. Before that it was during the winter of 1995-1996. Second, as best I have been able to determine it has never been frozen over by Christmas as it usually hasn't been cold enough long enough to do so. Even here at Lake Winnipesaukee, a much smaller lake of only 72 square miles as compared to Lake Erie's 9,940 square miles (larger than the entire state of New Hampshire), the lake's surface is not entirely frozen. There are still large patches of open water. Most of the bays and coves are frozen over, but not the rest of the lake. Call this yet another blown out of proportion story to support the AGW narrative. At first, I thought the USPS trucks I saw making deliveries on Sundays were doing so just for the holidays. However I still have seen a number of mail trucks out today making regular mail deliveries. Some 'regular' mail deliveries have been coming quite late, with two occasions just this past week where the mail wasn't delivered until well past 8PM. I don't know whether this has been just until New Year's or whether it's going to become a regular thing. Considering the USPS had talked about doing away with Saturday mail deliveries only a year or so ago, I have to think it is just for the holidays. I find it interesting that this particular professor who also happens to be white hates his race so much that he wishes nothing but its extinction at the hands of all the other races. I strongly suggest that if he hates whites that much that he should do all of us a favor and off himself. It is what he wants, isn't it? We do that here in our little town, where the town's ledgers are accessible via the town's website. It is almost real time, keeping in mind the small delay before expenditures and revenues show up in the ledger. It has certainly kept our spending under public scrutiny. Maybe it's time to do that across the board. I do understand that some government spending, particularly for things like certain defense and related covert operations, would be exempt from open books. But for the most part I think it would be a good idea. I have to agree with Skip on this one with one minor correction. Nikki Haley is one of the best UN ambassadors the US has had in some time. She's right up there with Jeanne Kirkpatrick and John Bolton. I can see a possible run for the White House in her future. And that's the news from Lake Winnipesaukee, where the frigid weather continues, lots of outdoor chores aren't being done, and where 20ºF weather will be considered balmy. The subject of today’s post? This is something that occurs to roads during the latter part of the winter as snow and ice thaws and the melt water works its way under the pavement during the day, and then freezes during the night. This causes the pavement to move, heaving upwards and creating ridges across the road. The pounding of traffic over these ridges can cause the pavement to break up. It also can lead to potholes as the broken pavement is displaced, leaving a void in the road surface. This void is a pothole. So why am I bringing this subject up at the end of December? Deb and I made the trip to the WP In-Laws in southwestern New Hampshire today. On our way there I noticed that the surface of some of the roads we usually take were rather rough. It took a few minutes to realize that the roads were suffering from frost heaves. It wasn’t just some of the town roads suffering from this malady, but some of the state highways were also afflicted. In all my years I have never seen frost heaves in December. They usually start appearing in late February or early March as the sun gets stronger and the daytime temperatures rise above freezing, but not in late December. The only thing I can think of is that the abnormally cold temperatures we have been experiencing have frozen the ground rapidly and any water that would normally have had time to drain away from under the roads froze in place instead. Hence the formation of frost heaves months ahead of usual. While I doubt they will get bigger as they have no additional supply of water, they have appeared far earlier and may cause more damage as both traffic and snow plows will have an extra couple of months to break up the pavement at the frost heaves. This does not bode well for our roads this winter. It is now certain that we will be guaranteed a white Christmas here in central New Hampshire, between the 7 inches of snow we received on Friday and the additional 4 to 8 inches forecast for Christmas Day. I have to admit that I am not looking forward to the upcoming snowfall as the Official Weekend Pundit Snowblower has suffered a breakdown and the parts I need to make repairs won't be in until the middle of the coming week. That means I'll be using a combination of a push plow and snow shovel to clear the driveway of The Manse, in turn making for a lot more effort to remove the snow. However there has been a small saving grace, that being that I find it's faster to use the push plow to clear the snow from the driveway proper than using a snowblower. What can take 15 minutes to do with the snowblower takes all of 5 minutes with the push plow. It helps that the driveway slopes downwards, meaning that gravity gives an assist. On the other hand I still have to get the snow off of the pavement which means using the snow shovel. Welcome to winter in New England. I find it interesting (but not surprising) that the leaders of the Democrat Party are rooting against the American worker and our country's success. After all, if American workers see the economy recover and more of them can find work (and keep more of the money they earn) what can the Democrats possibly run as a party platform? Yeah, that will be a winning campaign. There was a length discussion on one of the Disqus comment sections in regards to the best (and worst0 Christmas movies. I don't remember where I saw it and, quite frankly, I was too lazy to go looking for it. My two favorite versions were the ones starring Alistair Sim and George C. Scott. Sim's portrayal of Scrooge was very dark while Scott's Scrooge was by far the most human version I'd seen. In any case, BeezleBub and one of his friends will be coming by the evening to partake of Scott's version, a tradition we've had since before I had married his mother. Who are we to break with tradition? At least one NFL team is admitting outright that the 'take a knee' protest has hurt them and their income. They've been seeing a lot of empty seats at their home games, concession revenues are way down as are sales of team paraphenalia. They'll know just how much of a bath they'll be taking when sales of season tickets begin prior to next season. I'm expecting them to be shocked by the number of unsold tickets will be in their hands. In this case BuzzFeed UK science editor Kelly Oakes tweeted “All I want for Christmas is full communism now.” It is clear to me that she has no idea of the history of communism and that were she to get her wish that she'd likely be one of its first victims, either being summarily executed or sent to a gulag for “re-education”. I think I could explain it to her in one simple sentence, that being “The only problem with communism is that it involves people.” Communism doesn't work, at least not with human beings it doesn't. Insects like ants, termites, or bees have it down pat. But humans aren't insects. Nor will they ever be. She also has to understand that Marx was a misanthrope as he hated people in general, particularly those with whom he disagreed. If she really wants to experience communism, then I'll see about getting the old WAYBAC machine fixed and I'll drop her off in the Soviet Union circa 1921 or so. I'm sure she'll enjoy the experience. I recently replaced my Netgear WNDR4300 dual-band wireless router with a new Linksys SA7400 dual-band wireless router. Not that there was anything wrong with the Netgear router, but I found that it never had the range on 5GHz that I thought it should and there were times when there was 'funkiness' when using a VPN to access my employer's data network. The difference is day and night in regards to range and performance. I now have full 5GHz connectivity all throughout The Manse and have not had any issues with the VPN since I installed it. I did not use the Linksys Smart WiFi Router website to configure the router as I had confidence in my ability to properly configure it without the need to go via a roundabout means to do so. It also meant there was no outside access to the router's administrative functions except by a direct connection to one of its Ethernet ports which closed what I saw as a potential security hole. As it is Christmas Eve and I know that BeezleBub will be arriving at any minute, I want to take this moment to wish all of you a very Merry Christmas! And that's the news from Lake Winnipesaukee, where the last of the Christmas shopping is winding up, people are trying to get where they need to go before the snow starts in the early morning hours, and where the children are all wound up on sugar and the anticipation of a visit by Santa overnight. We survived the first real snowfall with only the Official Weekend Pundit Snowblower suffering a breakdown in the midst of the cleanup. It appears the breakdown was caused by a broken drive belt that runs the auger and impeller, something I am hoping I will be able to repair during my upcoming time off from work. Fortunately we have little, if any snow forecast to fall over the next week so it shouldn't put me in a bind in regards to getting the snow cleared from the driveway. The more debate I hear over the GOP tax plan, the more I realize that most of the critics have been focusing on one particular part or another of the plan and ignoring the parts that offset the points they bring up. If you only focus on one section of any tax plan you will always miss something that mitigates the possible negative effects of other parts. Then again, many of the critics don't care because all they want to do is raise taxes even more than they are now, claiming that we have a revenue problem. But what we have in reality is a spending problem, one that was made far worse under the eight years of the Obama Administration. Who helped win the war against Isis? I'll give you a hint: It wasn't Obama. It's amazing how well our armed forces do against monsters like ISIS when the rules of engagement make sense. It's not surprising to anyone who has been paying attention over the last few years that the Mueller investigations have seen cover up after cover up being committed by the very people who are supposed to be on the side of law and order. It is also devolving into a witch hunt, something that never turns out well. The only question to ask at this point is how many 'witches' will end up being burned by the very organizations that were in fact the perpetrators. And so on — ignoring the fact that the same progressives who’ve got their knickers in a twist about national concealed carry reciprocity fully support the Supreme Court decision forcing all 50 states to recognize gay marriage. We don't get to pick and choose which rights we will honor and those we won't. It's no different that saying we will pick and choose which laws we will follow and those we won't. Trying something like that usually leads to time in a courthouse and then a stay at one of the other fine state institutions as a guest of the state. Actually, I don't know if it's ironic or hypocritical that Facebook's Mark Zuckerberg made such a statement. Considering he was commenting about the FCC's reversal of Net Neutrality, a solution to a problem that hasn't existed, I'm leaning towards hypocrisy. One of my co-workers has lamented the reversal, noting that our ISP bills will skyrocket because now we'll have to pay for every site we visit, just like we had to before Net Neutrality came into play. Oh, wait...that's not correct, is it? We didn't have to do that before, did we? And we had both Title I and the Federal Trade Commission keeping an eye on such things well before this Net Neutrality garbage came into being. She didn't leave the Democrat Party so much as the Democrat Party left her. Gee, where have I heard that line before? When will this Progressive insanity end? I think we need to build a lot of mental institutions because these folks are out of the effin' minds. What will it be next, water? And that's the news from Lake Winnipesaukee, where we're getting closer to Christmas, the stores are getting busier, and where I'm doing most of my shopping online. The first substantial snowfall of the season arrived yesterday here in the Lakes Region, with our little town receiving about 5 inches. Clearing it away didn't take long and the late morning/early afternoon sun melted any of the snow left on the driveway, so there was no need to apply either sand or snow melt. The Weather GuysTM say we have even more snow coming on Tuesday with 7 inches likely to fall in this area. This likely means we'll have a white Christmas this year! She obviously has no understanding of the electoral college or why the Framers of the Constitution set up the election of President and the make up of the two chambers of Congress the way they did, that being that there could not be a tyranny of either the minority or majority. Or worse, she has a perfect understanding and wishes to impose a tyranny of the majority on those of us blessed enough to live in rural America. She wants to turn America into some version of The Hunger Games. She says we are “the core threat to our democracy.” But America isn't a democracy like the one she thinks it is. It is a constitutional republic with a representative democracy, with the only thing in common between the two being the word 'democracy'. They aren't the same thing. There are a number of things she has overlooked in regards to pushing her dream of marginalizing rural America – We have the food, the guns, and a large portion of our military comes from rural America. If she wants a civil war we'll give her one, one that she and her side will lose. As a follow on to the post above, there's this from John Hawkins that explains why the DC elite want our type of Americans to go away. I get along with cops, soldiers, preppers and country boys -- the sort of guys who know how to shoot, know how to take care of themselves and would watch your back in a fight if it came to that. I don’t much like the government, but I do like small town government better than government in D.C. If someone has to be in charge, better the sort of guy you can run into at the grocery store who will give you an answer when you want to know why the potholes on your street haven’t been fixed. D.C.’s different. I know the Democrats there hate me because I’m a straight, white, Christian, Southern conservative and the people that run the Republican Party today would only care what I think if I had hundreds of thousands of dollars to give them. That’s why if I can make trouble for either group, I’m game. There are always people in D.C. who think they have a better idea of what to do with my life and my money than I do. I don’t need any “help” from the government and I’m not okay with the government using my money to help people who should be helping themselves. When I want to give to charity, tithe to my church or buy Christmas gifts for a poor family, I do it. We may all have to pool our money to pay for street signs, the police and the military, but I don’t see any reason my money should go to people on welfare for years, the families of anchor babies or scammers doing Crossfit right before the government hands them a disability check for their “intolerable” pain. Go work for a living like the rest of us. We live in a country run by politicians and bureaucrats who can’t do anything right and yet they think the solution to that problem is to give them even more power over our lives. You feel the same way I do? Then you’re one of the Americans the elites in D.C. want to go away. We're an embarrassment to the DC elite. They offer us 'help' and we respond with “Thanks, but no thanks. We got this.” They don't like hearing 'no', at least not from those they see as their inferiors. They want to be the only ones to use that word, and then only when it is directed towards us. These people need a dose of reality. A UK mother wants her six-year old son's school to ban Sleeping Beauty because she doesn't give consent to be kissed by the prince. Really? That's what she thinks is important? I feel sorry for her kid. Muslim students at a Catholic university complain that Christmas is getting too much attention. I wonder how it would work out if Christian students at a Muslim university complained that too much attention is paid to Ramadan? My guess is that they would be beaten or worse. Maybe we should give those poor students a few bucks so they could go buy a clue. Bill Whittle knows just how to end leftism. Give a listen. See? All it takes is money...or in this case, lack of it. I find it interesting that the state that keeps telling the rest of us that it is going to be a 'socialist paradise' is looking more and more like literal Hell as the brush fires there engulf everything. Maybe there's a message in those fires? And that's the news from Lake Winnipesaukee, where winter has definitely arrived, more is coming, and where we hope to finish our Christmas shopping this week. 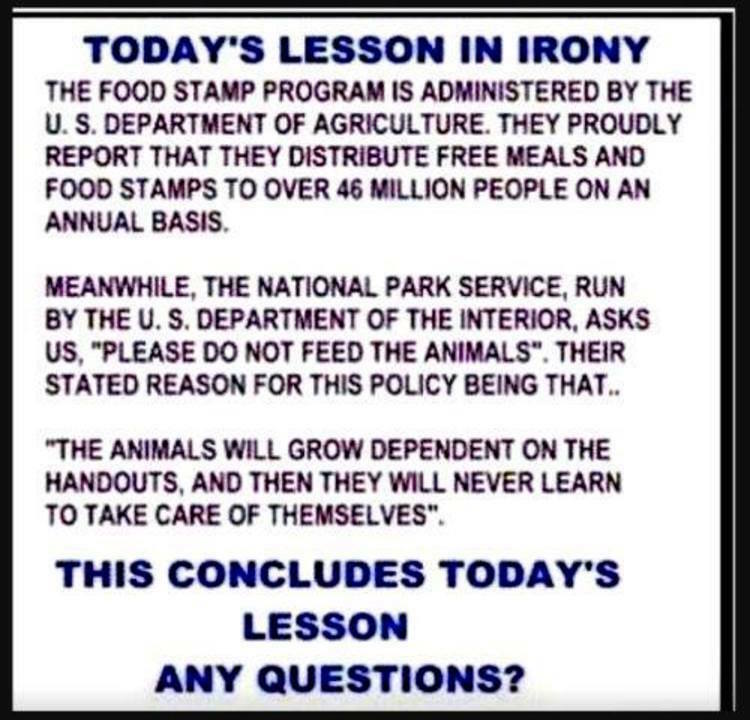 Maybe we should have the National Park Service run the welfare program in this country rather than Health and Human Services. It seems like a no-brainer to me. Winter is fast approaching and the last of the outdoor work at The Manse in preparation for winter has been completed. The trusty Ram 1500 has been undercoated, the driveway markers have been put in place, the last of the leaves have been removed from around the mudroom entryway, the lawnmower has been stored away and the snowblower moved within the garage to its winter location. Snow shovels have pulled down from storage and the sand buckets have been moved and filled. All of the outdoor lights work (needed for snowblowing and shoveling at night), and the gas can for the snowblower has been filled. And so it goes in small town New Hampshire. Speaking of small town New Hampshire, we are going through out budgeting process for both the town and school. It can be a time-consuming effort, with some wanting a lot more money this coming year and others making do with the same amount they spent this year. One of the biggest parts of the budget for our town is the school system which takes up over 68% of the money the town spends. It's funny how all that money “for the children” ends up paying rather high salaries for teachers, supervisory staff, and paraprofessionals. I would say it would be worth it if we had the best schools in the state and out kids performed at the top. However the reality is that our school system is really slightly above average. We spend a lot of money for 'slightly above average'. Ladies, ignore all of the crap you read about what men think or want in the various magazines or women's websites. Here are 12 things you really don't know about us. The most amusing (and ironic) one was the one that dealt with the “media portrayal of certain manliness tropes,” specifically those about military men. I served 10 years in the military and once watched a roomful of females go a bit starry-eyed at an actor on TV in army uniform. One of them blurted out “That’s a real man” whilst the other soldiers and Marines looked over in confusion. We were all in Iraq at the time. Explain how an actor on TV portraying manly military service is more manly than an actual military serviceperson overseas serving? It's simple – he gets paid a ton of money to portray a military man. That alone makes him more attractive to women. The real military guys tend to be invisible, even to some women in the military. The length of the list of MSM-DNC personalities being fired for sexual harassment and or sexual assault keeps growing. One has been suspended for reporting egregiously fake news. Because those in power, whether they really are or think they are, believe that the rules don't apply to them...until they do. Then everyone is so surprised. At least some gets it. All of the crap about 'diversity”, be it cultural/racial/sexual and the whole list of other 'diverse' pigeonholes the Progressives have created, has been pushed so hard as a means of tearing people apart by making everyone a victim, except for white heterosexual males of course. We are the eternal oppressors, the boogeyman that the Progressives need to stir up divisiveness and, dare I say, hatred among the various newly defined victim groups. How any of this is supposed to make things better totally escapes me. It doesn't. It merely creates more suspicion, more prejudice, more hatred, all in the name of fixing some problem that hasn't really existed except in small pockets here and there. Now it's everywhere. Listening to the hew and cry about the FCC's move to repeal Net Neutrality, very few have bothered to ask what was lost when the Internet was brought under the auspices of the much hated and woefully out of date Title II. While people thought Net Neutrality fixed problems, problems that did not yet exist, a lot of enforcement tools that did exist in regards to preventing ISPs from doing the very things Net Neutrality was supposed to prevent (but doesn't) were taken away. But no one mentions that. What Net Neutrality also killed was competition because in effect the FCC would be choosing the winners and losers, something that always ends up costing the American consumer more money. And that's the news from Lake Winnipesaukee, where winter is approaching, fall is fading away, and where we still haven't started our Christmas shopping.